Embree is considered one of the most gifted athletes ever to participate at LCHS. He excelled on the football field, basketball court, and track where he possessed incredible jumping ability and speed. He was always a force to be reckoned with as an intense competitor, and was clearly the best athlete on the field and court. He was a conference and regional champion in four track events: triple jump, high jump, long jump and hurdles. Embree was a state champion in the long and triple jump in 1970. 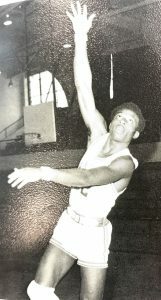 Embree would attend WKU on a football scholarship in the fall of 1971. 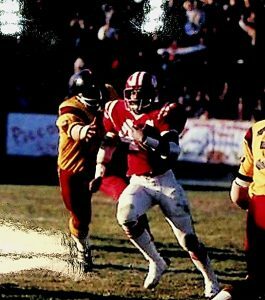 He would also be a member of two World Football league teams, and played for five seasons. 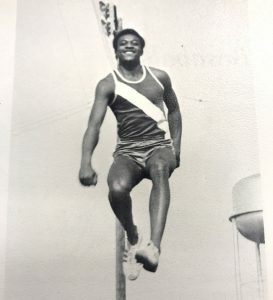 From Jack Mitchell – Johnnie was an outstanding athlete who especially excelled in his jumping ability. He had the quickest feet I had ever seen. He was truly one of the most gifted athletes I had the pleasure to coach. Not only was he a great athlete, but truly a pleasure to be around. Everyone loved Johnnie. From Dale Embree – John was one of thirteen children in the Embree family. He was the second oldest boy. I would best describe John as a worker, whether it be around the house doing his chores or on the football field, basketball court, and track. He just loved to work. He was considered very neat and particular of his surroundings. He was very well-mannered and made a strong effort to be as polite as possible. Everyone loved being around John. He was active in his church at Buffalo. He was considered the fastest of all the Embree’s. He had the ability to run around and away from his opponents. From Reggie McCubbin – Johnnie and I were teammates in varsity basketball for two years. It was a privilege to be on the same team with such a gifted athlete. Johnnie was a state champion in track and a tremendous running back in football. He always gave one-hundred percent and as a teammate you knew he had your back. He loved competition and had a strong desire to win like no other. Wish you were still here with us my friend, but your spirit is in the halls of LCHS, on the hardwood and all the athletic fields of competition. From Dr. Mark Harvey – Johnnie was the speediest human I ever knew. He could run faster sideways than I could straight ahead which made it difficult to block for him during football games. He always had that big smile on his face. He was a pleasure to know as a friend and teammate.